At the Stratford Place residential project, the community of Sultan, Wash., discovered how a paving application that looks like a Rice Krispies Treat(R) can eliminate puddles on their streets and sidewalks forever. Pervious concrete provides Stratford Place with improved storm water drainage for hardscapes throughout the development. Craig Morrison, owner of CMI Homes and developer of the Stratford Place community, convinced the city of Sultan to allow all the surfaces of the project to be laid in pervious concrete. Working with the Washington Aggregates & Concrete Association, Morrison poured three or four driveways to get a feel for placing the pervious concrete, and then set out to place 32,000 square feet throughout Stratford Place. The Stratford Place project was the first in Washington to use pervious concrete for all its surfaces including driveways, sidewalks, and the main street. The construction included 20 new homes with a 20-foot wide roadway and 4-foot integrally colored sidewalks. According to Bruce Chattin of the Washington Aggregates & Concrete Association, "The only thing not pervious in this subdivision is the rooftops. The lawns are less pervious than the driveways or the street." 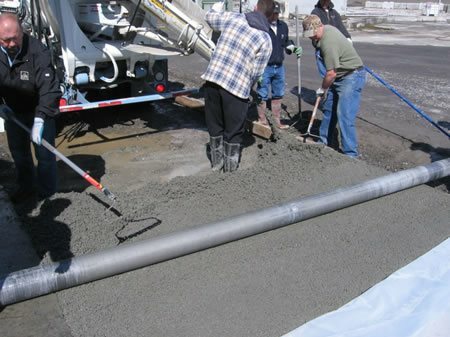 Recognized by the U.S. Environmental Protection Agency as a best practice for storm water management, pervious concrete is an open void material designed to allow rainwater to filter through the paved surface into the ground or a storage container rather than settling on the surface. 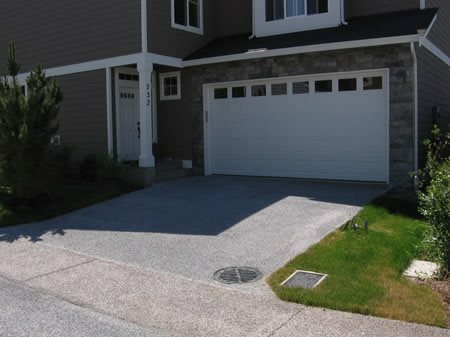 In this project, pervious concrete was used as a 2-part on-site storm water management system consisting of pervious concrete pavement (8-inches) and a coarse gravel retention layer (8-inches) for storm water storage. Site specific design of the retention/recharge area include: an initial soils site survey, and site specific storm water calculations for volume and duration. No storm water leaves the site. The benefits of pervious concrete for storm water management and other green solutions are many, but Morrison was surprised at the return and many construction costs that were eliminated with the use of pervious concrete. "He got so excited about it," says Chattin, "he went out and started his own pervious placement company, PCI Incorporated." 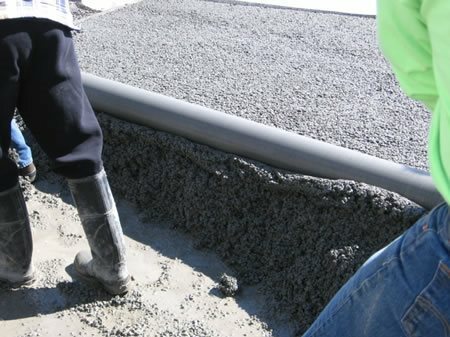 According to Chattin, interest in pervious concrete is growing but remains difficult to get placed due to slow acceptance in local jurisdictions. "We want to reduce or eliminate runoff," says Chattin. 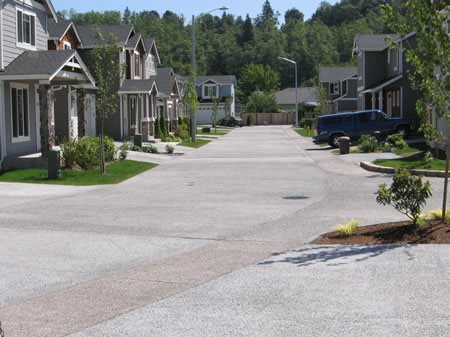 "We have 10-12 pervious residential subdivisions—more than any other area of the country." 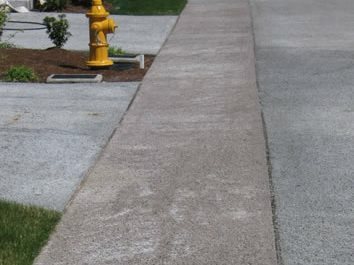 At the 2007 American Institute of Architects (AIA) National Convention and Design Exposition, pervious concrete will be among the cement-based applications for sustainable development highlighted by the Portland Cement Association (PCA). The organization will have a full pervious concrete display to demonstrate how this innovative technology filters stormwater, while providing a solid base for sidewalks, roadways and other hardscapes. "The cement industry prides itself on providing the building community with numerous environmentally responsible solutions," said Dave Shepherd, director of sustainable development for the Portland Cement Association. "Pervious concrete is a prime example of how the industry continues to use new technologies and research to develop practical, sustainable applications."